This Ohio prototyper combines a lifetime's experience with press brakes and a knack for part and tool design to serve job-shop customers across a range of industries. Servo presses combine the flexibility of hydraulic presses with the speed of mechanicals. This dynamic drive behavior maximizes productivity and reduces energy consumption. Here we review the capabilities of the various drive designs. Companies running old equipment or presses that have not been well maintained will likely find it difficult to compete. In particular, stampers manufacturing tighter-tolerance parts will benefit from operating tighter-tolerance presses. Under new ownership, this New England laser-cutting operation counts on technology and a small but skilled staff to successfully supply prototypes and small-lot parts. The International Manufacturing Technology Show makes its biennial visit to McCormick Place this September, boasting 1200 exhibitors displaying the latest and greatest in machine-tool technology. Press brakes can do a lot, though challenges abound in creating top-quality parts. 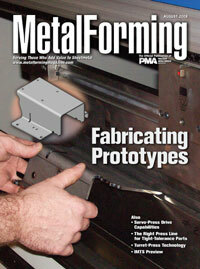 Here we discuss the types of bending, and factors that affect machine performance. Special tooling allows A. Zahner Co. to create custom panels that clad some of the most famous museums and art houses in North America.